Update 19 December 2018: In response to player requests, here is a print-and-play version of the modern US civil war simulation. The full game can be made at home for free using the following components. Pieces. Recommended pieces are below, but of course pieces of any size and shape may be used so long as ownership and the type of unit is clear. Pieces identified as a “token” below are for marking card eligibility and resources. “Cubes” are Troops and Police. “Cylinders” are Guerillas; they should be marked on one end to indicate Active status. “Discs” are bases. *Apologies for the poor quality of the art on the cards. Card design is hard. Tensions are rising. Many people think America might face a second Civil War. What would it be like? Defense and security experts have extensively modeled contemporary civil wars. The models expose the fissures and forces that make counter-insurgency (COIN) operations bloody and difficult. COIN situations are hard to stop; nobody wins; it is a dumpster fire. Recently, CIA analyst Volke Ruhnke published a commercial game based on COIN models. Andean Abyss (GMT 2012) is set in Colombia in the 1990s. Four separate factions with different resources and goals are mired in a formless, ever-shifting conflict. I think 1990s Colombia is a good model of what America will experience if we fall into civil war today. My analysis is non-partisan: It does not matter which parties are the government and the rebels. We have in our country today four armed factions: The State, Antifa, Tea Party, and Crime. The State: Whoever is in charge will be trying to calm the whole country. Rebels: The government will have armed opponents. If the government is Right, the rebels will be Antifa. If the Government is Left, the rebels will be Tea Party. Vigilantes: Whoever holds the government will lose control of armed “allies” who have more bloodlust than the officials in Washington. The Left will lose control of Antifa, the Right will lose control of the Tea Party. These rogue forces will conduct an extra-legal vendetta against the other side. Crime: Armed criminal gangs are already active in this country. The chaos of a COIN situation will provide ample opportunities for expanding. 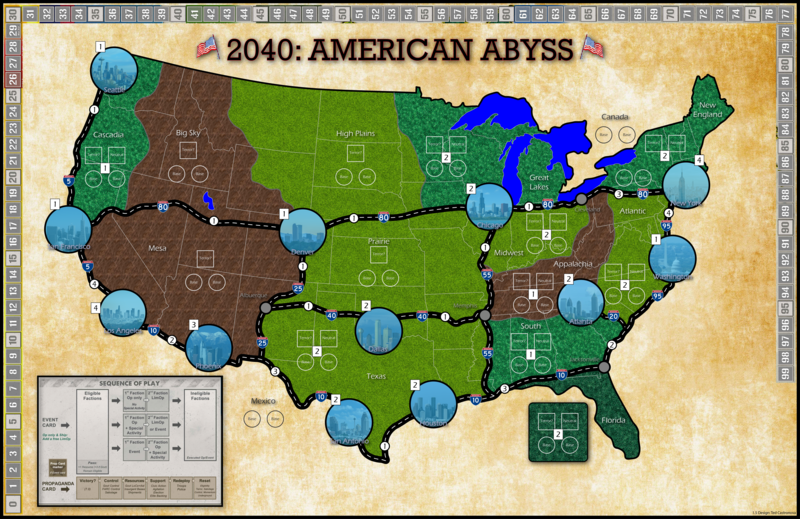 To show what this horrible war would be like, this variant of Andean Abyss is set in the United States in the year 2040. In order to play this variant, you must it is strongly suggested that you first buy the base game Andean Abyss to obtain its pieces, cards, and core rules. However, if desired, the game can be built at home by downloading and printing the items in the links above, and gathering the appropriate pieces. Now, because Andean Abyss is a realistic simulation, the rules are complex. This is not a family board game. Therefore, in order to deliver the lesson at a simpler level, I also designed a student edition (American Abyss Student Edition). This packet provides a stand-alone, extremely simple game that illustrates the core problem of a four-faction conflict like the one we face. The packet also includes everything you need for running a classroom exercise on the topic. No additional materials are needed. These materials are offered free of charge in the hopes that we will all realize how foolish it would be to draw blood over whatever it is that divides us now.